Deezer updates web interface with focus on recommendations | What Hi-Fi? Deezer has announced a new look interface for its web platform. It's designed to look smarter and put music recommendations at the forefront. The update is a result of usability testing and feedback from Deezer users and will make music recommendations, tailored to each user from the streaming service's 35 million strong catalogue, easier to access. 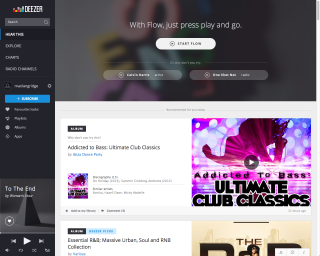 Deezer's 'Flow' function has been made more prominent and will instantly create a playlist of recommended music for each user. The new look interface is based on Deezer's tablet app and as such, claims a cleaner, more refined feel. A new sidebar provides quick access to users' libraries and the core features of the music service. Personalised welcome screens have been introduced too and provide statistics such as your most listened to tracks, genres and artists, as well as giving playlist and radio suggestions based on your mood or choice of music genre. Alexandra Croiseaux, VP Product at Deezer, said: "Deezer has built a global audience of over 16 million people, so we have access to a huge amount of usability data, meaning we can adapt the service to the needs of our users. "We believe our new design is truly smart in terms of both form and functionality, and we are putting the focus squarely on what matters the most - the music." The new look Deezer interface is live as of today, 1st October.